Frances Zielinski Nalwasky, the very latest centenarian to grace Staten Island’s elite roster sadly passed away on Thursday, October 18, 2018 at Carmel Richmond Nursing Home at the age of 100. Frances worked for 29 years as a valuable member of the borough’s school lunch program, 16 years as an assistant cook at St. Paul’s School in New Brighton, and 13 years as head cook at Sacred Heart School of West Brighton. In fact, Staten Islanders still remember Frances and often express their love for her lunches, especially her green salad with special spices. Her daughter-in-law, Bonnie Bell Nalwasky, tells us her mother-in-law worked into her 70s and on more than one occasion said: “I would still be working if the buses were running to Port Ivory,” referring to her tenure at the former Procter & Gamble plant. We’re told Frances lived more than 50 years in the “white house” overlooking the Kill van Kull on Richmond Terrace, right near the plant. Frances was employed by Procter & Gamble and Wallestein’s before the birth of her two children: A son, William, and a daughter, Judith Padavano. The key to her longevity was the time spent with her great-grandchildren, Rebecca and Nicholas Borges, Kayla Creech and Emma Creech. She always professed her secret to longevity was hard work. She never liked to nap — she said it was a waste of time — and she enjoyed all her healthy home-cooked meals. Born Sept 19, 1918, the native Staten Islander was one of 10 children. Frances’ hobbies include crocheting, cooking, word puzzles. 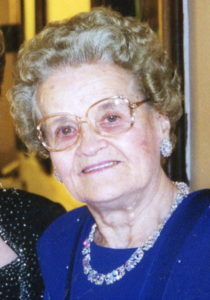 Frances was predeceased by her loving husband, William and her siblings, Mary Ziel, Peter Zielinski, Walter Zielinski, Adam Zielinski, Sophia Larsen, Josephine Tanzosh, Frank Zelinski and Ann Scanlon. She is survived by her beloved daughter, Judith (Salvatore) Padavano, her son William (Bonnie) Nalwasky, her sister, Evelyn Montella, 2 grandchildren, Kimberly Borges and Kristen Creech, also 4 great-grandchildren, Rebecca, Nicholas, Kayla and Emma. Viewing will be held at Cherubini McInerney Funeral Home, 1289 Forest Avenue, Staten Island, NY on Sunday from 2-4pm and 7-9pm. Funeral Mass will be at Sacred Heart RC Church followed by a burial at Moravian Cemetery. In Lieu of flowers, donations to Meals on Wheels, www.mealsonwheelsofsi.org or to the SI Council for Animal Welfare, P.O. Box 120125, Staten Island, NY 10312-0125 would be greatly appreciated. It is always difficult to say goodbye to those who lived as an integral part of our world. The empty space remains but much of it takes time to fill with the overflowing love from others in our world. I am so sorry the family feels this pain once again. Know you all are loved and close to my heart though I am far from you. Aunt Fannie lives too as a part of my heart.always. Love you Aunt Fanny! Will miss you. I remember the visits Rob & I would make to your home with grandpa Ziel & when Uncle Willy & Grandpa (Fred Ziel) would take us fishing. I always enjoyed the visits we had.